With a busy winter of exploring over, it was time to leave Almerimar and head for Morocco. First stop Melilla to check out a beautiful town and pick up some tax free diesel! We had an awesome crossing from Spain, after passing through incredibly busy shipping lanes we had a quiet night ... except no one told the dolphins it was meant to be quiet! Seems they all hang out on the North African coast where it hasn’t been over-fished! Whilst the Spanish are adamant that Gibraltar is their property, they are happy to own a couple of lovely bits of real estate on the North African coast! Mildly hypocritical but c’est la vie, it’s a beautiful town to explore and we very much enjoyed all things Spanish but with a certain North African flavour! After a lovely few days in Melilla it was time to continue on to Morocco. Neptune graced us with a pleasant breeze from the east to guide us on our way to Saidia. It was the Moroccan’s turn to keep an eye on the marauding Ootnics - the Navy kept a close eye on us as we cruised along ... “Are they drug smugglers? !” ... Our sailing was erratic for sure but not drug induced! We didn’t get boarded but they certainly made their presence known! We were initially a little nervous about clearing customs and immigration in a new continent, but everyone was super friendly ... Especially to the tall blonde from Australia who somehow seems to speak perfect French! Everyone we met was wonderfully helpful and went out of their way to help us and we couldn’t have asked for a more hospitable welcome and stay. One of the first things we noticed about Morocco is that negotiating prices with Moroccans is, what shall we say? Interesting ... When trying to figure out how much something would be we were consistently met with the question “What would you like to pay? !” It’s a hard question to answer in any country! Suffice to say being the the ex-City types that we are, we managed to over estimate a ‘fair’ price each and every time time, but to us it seemed perfectly reasonable and everyone left smiling! 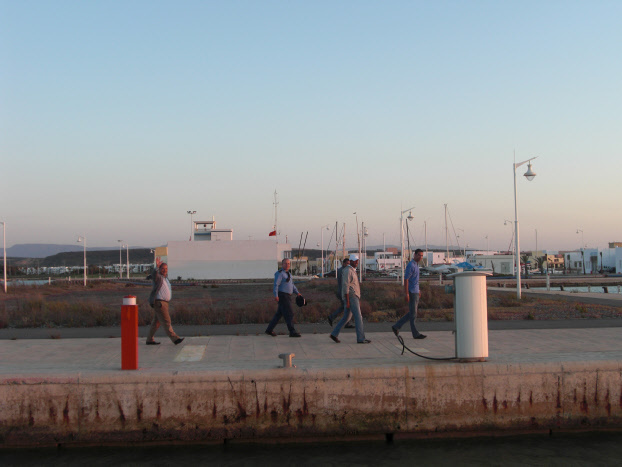 Saidia marina is a little way out of town and we had a ball on our bikes zooming round the countryside exploring. The staff at the marina went above and beyond what we could ever have expected from them ... When met with questions about local sites and how best to get around, Abdhullah insisted that he show us around. No was simply not an acceptable answer! With only a half day at work the next day, he suggested with a grin that he would show us the real Morocco from the comfort of his car (rather than us hiring a taxi) and that we must share a meal with his family. Well, what a day we had. Abdullah went out of his way to show us what he could and, as for the meal, well, it was nothing less than a feast & his gorgeous family some of the most welcoming people we have ever met! Thank you Abdhullah, you made our stay quite wonderful and something we will never forget. After an absolutely amazing stay, the time came to hit the road ... well set the sails ... you know what we mean :) Having read many reports of intense exit searches by customs, we were a little apprehensive about what awaited us ... However, our fears were misplaced and instead we were graced with smiles, waves and requests that we come back and visit again soon as we departed to make our way across the Med again. We will definitely be back someday to further explore this wonderful country which quite simply blew us away with the hospitality of its people.